How do you deal with tantrums? Every parent dislikes the dreaded tantrum, but the question of how to respond to a tantrum seems to be somewhat divided. Many, including some child psychologists and writers, advise that ignoring tantrums is the best way to stop them, on the grounds that children use tantrums to try to get their own way, and will stop having them if they realise they’re not working. In her book, “What Every Parent Needs to Know“, Dr Margot Sunderland, Director of The Centre for Child Mental Health, adds an extra element. She writes that as well as this type of tantrum, which she calls a ‘little Nero tantrum’, there is what she calls a ‘distress tantrum’ in which the child is overwhelmed by their feelings, and needs your help. She advises ignoring a ‘little Nero tantrum’ but comforting a ‘distress tantrum’. She gives various tips for distinguishing between the two types, but warns, however, that a ‘little Nero tantrum’ can turn into a ‘distress tantrum’. Hmmm. Here is my problem with all of this. First, if there’s a chance that the ‘little Nero’ or power struggle type tantrum can become a distress tantrum, then I’m inclined to hang around just in case. The idea of leaving a child alone to deal with their feelings, though advocated by many, is not one that I buy into. 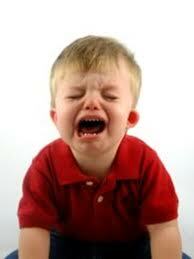 Young children have trouble dealing with strong feelings. This is precisely why they have tantrums. So how is leaving them alone going to help them resolve them? Besides, I would never ignore my child when he is crying, for whatever reason, little Nero or not. When we ignore a child who is upset, angry, frustrated, we lose that vital ability to reconnect with them. Ignoring also shows disrespect for him and for his feelings, and does not model compassionate behaviour. Ignoring just doesn’t seem right to me at all. Secondly, if we go for the idea of a tantrum being used by a child to get their own way, this attributes to the child manipulative behaviour, which must lead to the conclusion that they are in fact not upset but just acting. It would also attribute to them an ability to think in such a devious manner, which I think is somewhat questionable, especially whilst in the throes of a tantrum. It brings to mind the equally dubious message pedalled by some parenting gurus that babies have the capacity to manipulate, and this is a reason to fail to respond to their cries. Now, granted, a child has the capacity to whine and cry and carry on about something that they want that we’ve said they can’t have. A tantrum, however, indicates a loss of control on the part of the child, due to their being overwhelmed by their strong feelings. OK, the power struggle may have been the trigger, but this just tells you that frustration and anger are most likely the predominant feelings they’re experiencing. For me, a preceding power struggle is not a reason to ignore and fail to empathise with a child’s feelings. It is very easy to empathise and validate whilst still not giving in to demands. Even without the tantrum, I’d say this is the way to go. 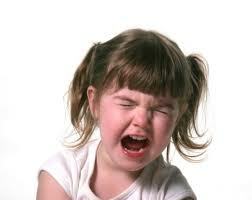 Many fear that giving attention to tantrums gives attention to and encourages bad behaviour. But the way I look at it is that if we ignore a child’s feelings we teach them to suppress them in order to gain back our attention. I do not want to teach my child to suppress his feelings, and I certainly don’t want him to think I don’t care about his feelings. I think the most important change in attitude that needs to be made is that of tantrums being bad behaviour that must be stopped. Tantrums are an expression of extreme emotion. The problem arises from our own dislike of the noise and fuss, and often from our consciousness of onlookers. Once we have ceased to see tantrums as bad behaviour we can respond to our child with empathy and understanding, so even when they can’t get what they want, at least they feel listened to and understood – surely a better recipe for connectedness, and if you want the tantrums to stop, connectedness is the key. When a child has a tantrum, whatever the cause, they are experiencing a frightening loss of control, and overwhelming feelings of frustration, anger, hurt and powerlessness. They need us to show that we are there for them, that we are strong enough to handle it even it they aren’t, and so are providing that safe base they so desperately need at their times of crisis. This entry was posted on Friday, January 6th, 2012 at 8:52 pm and is filed under Connection; being an attuned parent. You can follow any responses to this entry through the RSS 2.0 feed. You can leave a response, or trackback from your own site. 5 Responses to How do you deal with tantrums? Thank you for this Jo. I think that tantrums are definitely a cry for help, and calling a child a little Nero perpetuates an idea that children and parents should have an adversarial relationship. I really enjoy your blog, thanks. Thank-you Lisa! That’s encouraging to hear. In a training today, the trainer discussed the method of ignoring tantrums because children use tantrums to manipulate and “just to get attention.” I was quietly furious. It wasn’t the time or the place to argue, but here I can share my own thoughts. But why reinvent the wheel, Parenting With Understanding said it perfectly. interesting article. I do agree that we need a more compassionate response to tantrums.